This past September I was introduced to ebeanstalk.com and really enjoyed the unique way that they make browsing and shopping for toys so easy and organized. If you want baby toys, you don't want to have to look through pages of items only appropriate for 7-year-olds, right? Instead, ebeanstalk allows you to search for the specific age of your child (down to the ¼ of a year) to remove any hassle while also giving you great gift suggestions. 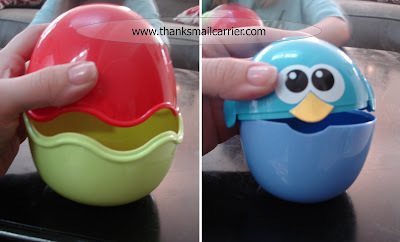 So whether you need toys for 1-year-olds or toys for 2-year-olds (yes, there is a difference!) ebeanstalk will help you find just what you're looking for - and more! When our surprise toy from ebeanstalk arrived, Big Sister E and Little Sister B were more than excited to check it out. Unwrapping the box, we found a cute set of Nest and Stack Birds awaiting us. 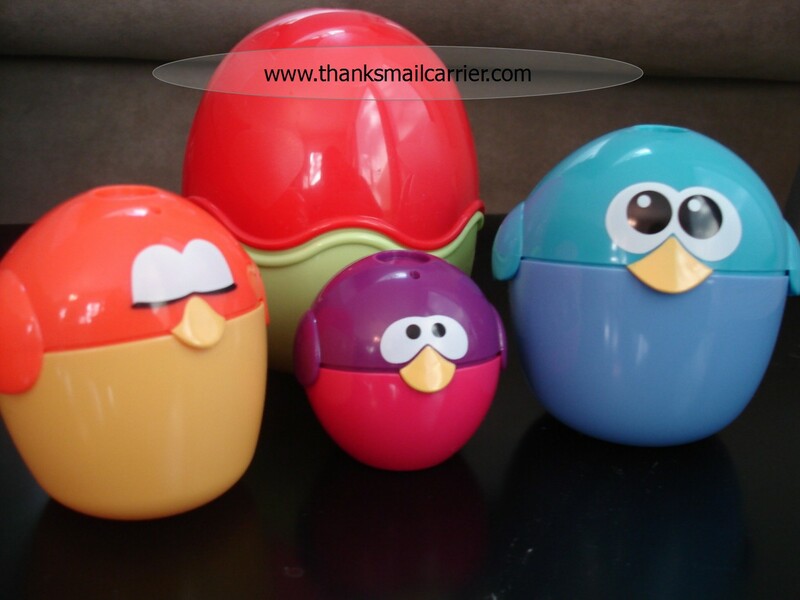 This set of three adorable birds and their egg is designed for stacking and nesting, as well as any peek-a-boo or hide-and-seek games that, let's face it, just about any child would love. The variety of shapes, sizes and colors is eye-catching and fun and a lesson on counting or work on fine motor skills and problem-solving can be thrown in while just having a good time with these little guys. 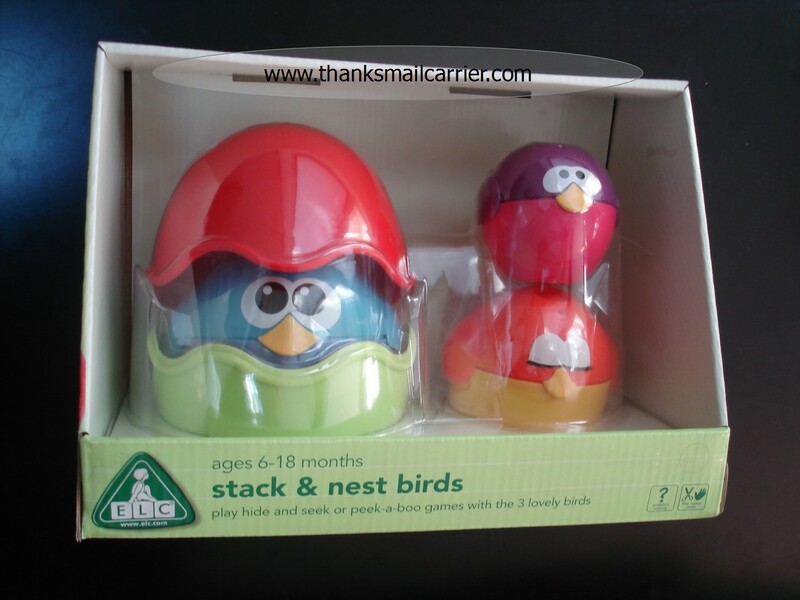 With a target age range of 6 - 18 months, I was immediately concerned that neither of my girls would really be all that interested in the Nest and Stack Birds and that they would be far too easy for them. However, we pulled them out and decided to give them a try to see just what a younger child might enjoy. Right away I noticed that the Nest and Stack Birds would be easy for a young child to play with (the pieces can be grabbed from just about any angle) and that there wouldn't be any concern about small parts. They would also work very well for individual or cooperative play, as a child could open, close and stack the parts on their own or a parent or older child could hide something in or under one to encourage the discovery process. Unfortunately, my fears of my kids not being interested in this toy were right... but not in the manner that I had expected. Instead of giving up on playing with it because it was too easy, their frustration soared when we found it to actually be quite difficult. Both the birds and the egg have to be matched up precisely in order for them to connect properly (having the head tilted to the side even slightly causes it to not sit right due to an indent for the beak) and quite often the egg popped back open no matter how hard I tried to push on it to get it to stick. Whether that was due to the lip on the bottom piece or just a poor design, I'm not sure, but if I couldn't do it then how was I to expect that my kids could? After a few more minutes, Big Sister E gave things a few more attempts before abandoning this toy for something better and I ended up taking the entire set away from Little Sister B because of how much she was crying in aggravation over not being able to do things on her own. Considering that this toy is listed for such a young age, it might actually be better for babies (around the 6-month mark) who wouldn't mind the pieces not matching up and would like the bright colors. Or possibly for much older kids (5 or 6, maybe) who would have an easier time... although I'd find it hard to believe that the latter age would be interested in a "baby toy." 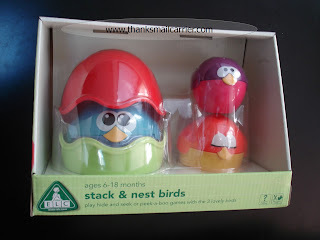 Although we were disappointed in the outcome of the Nest and Stack Birds, I am still impressed overall with ebeanstalk.com and the way that they make shopping for toys convenient and easy. Most of the toys that they list as suggested for 4-year-old girls and 2-year-old girls are spot-on for my daughters' interests and would make great gifts. In the end, all children are different and it is always important to decide on how well toy suggestions will work for each individual child's personality to make sure that you've got a winner! Your honesty here is what makes you ROCK! I could see why they would get frustrated. 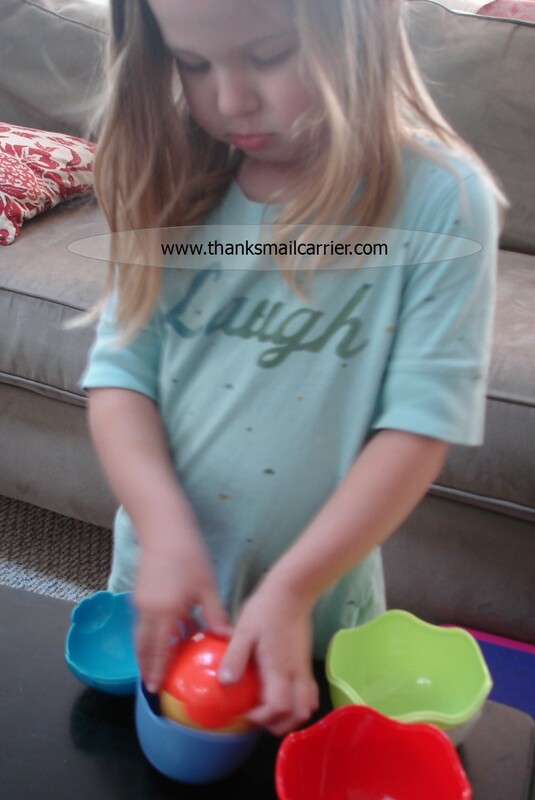 Any toy that doesn't do what a child wants, will result in a meltdown. ebeanstalk does have an amazing site though, which is why I visit there quite often. It's a great place to go for gift ideas! Your girls seem to be disappointed, indeed. You have enough time until Christmas to find other toys ,more interesting. Inviting you to add your blog at http://olahmomma.com/momlounge - a mommy blogger directory and more, where you can also meet more mom bloggers like you. I found you through Follow Me Back Tuesday. Please come by and sign up for our Super Hop at http://supopi.blogspot.com/2010/11/super-hop-weekly-post.html Hope to see you there!